In addition to individual volunteer work projects, Global Volunteers also provides genuine opportunities to volunteer abroad as a group and contribute to long-term development projects. Over the years, we have mobilized hundreds of volunteers on organized group programs. We can customize for a range of group sizes starting at 6 and up – in 17 countries across 5 continents: Africa, Asia, Europe, North America, and South America. We’d like to engage your group in meaningful community service projects. Your group – University or college, high school, workplace colleagues, families, church or civic committees, Global Volunteers alumni, friends and neighbors, and the like – is a valuable resource to our community partners. We can work with you on a schedule and an assignment that best meets your volunteering goals! 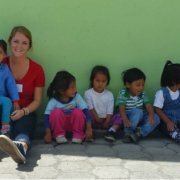 Why volunteer abroad as a group? When you volunteer abroad as a group, you can obtain educational, cultural, and occupational opportunities that can’t be duplicated through a traditional “tour” experience. Plus, you will learn about each other (and yourself!) in a non-traditional way as an intact volunteer group. As a team, you will connect with people who need and want your assistance on important development projects – like Indian English teachers, Tanzanian health care aids, Romanian care-givers, and Cuban construction workers – and then learn first-hand about their culture and traditions while also providing essential services to the people you serve. What does Global Volunteers consider a “group”? A Global Volunteers group contains individuals who simply want to volunteer together. You could be a group of like-minded friends looking for a meaningful Summer or Spring Break, a family seeking to connect on a new and deeper level, or maybe a corporation wanting to gain teamwork skills on a unique adventure. We also work with high school and university volunteer groups on a variety of different projects. Our Volunteer Coordinators work with you and our in-country team to ensure we can customize a program to fit with your group’s particular skills or area of study as best as possible. We have a group! Where can we go and what type of volunteer work can we do? You can volunteer abroad as a group in almost any of our 17 service programs around the world! Just let us know where, and we will do our best to make it happen. The length of your stay can be between 1 and 4 weeks, with free time in the evenings and on the weekends. That means you will be able to add excursions and cultural activities as well. The type of volunteer work you will do depends on (1) what our host communities have requested from us AND (2) the preferences of your group. Global Volunteers’ unique philosophy of service requires volunteers to work at the invitation and under the direction of local community partners – and one-on-one with local people. While remaining faithful to this philosophy of service, we will also do our best to tailor to your preferences. For example, a group of Medical students might prefer to work with the local health care aids, so we would then connect with our in-country team to find the available and useful opportunities. In many cases, your group may have a mixed-skill set. This is wonderful as well! We allow our volunteer groups to work on a variety of projects – part of your group can teach conversational English at the local secondary school while the other part of your group heads off to a construction project on a local building. What about money… How do other groups afford this? Is fundraising right for your group? Many of our volunteer groups have been able to raise enough money to cover their entire service program fee. So if your group decides to cover the program fee through donations, we’ll help you along the way with our online fundraising page! We’ll also provide helpful tips, creative strategies, success stories, and more. You’ll be amazed by what you can achieve as a team! Let your local newspaper, school, church, etc. know that you’re going to volunteer abroad as a group – especially if you’re fundraising. The more awareness you raise, the more support you’ll gain! Once you arrive in-country, our local team will welcome your group at the airport. Within no time, we are confident that you will feel quite comfortable and safe at your “home away from home” – given the support from our dedicated and experienced local team, delicious local cuisine, and comfortable accommodations. Let the volunteering begin! We encourage you to share your experiences with others around the world throughout your volunteer journey. From the moment you sign up to volunteer abroad as a group to 6 months later when you’r reminiscing about your adventure, use #GlobalVolunteers on your social media accounts – Twitter, Instagram, and Facebook! Your experiences can inspire others to follow in your footsteps by organizing their own Global Volunteers group. Ok, we’re ready to pack our bags! The next step is to chat online with a Global Volunteers Volunteer Coordinator. We look forward to assisting you in this exciting volunteer adventure! In the meantime, read about the experiences of others groups on our blogs.